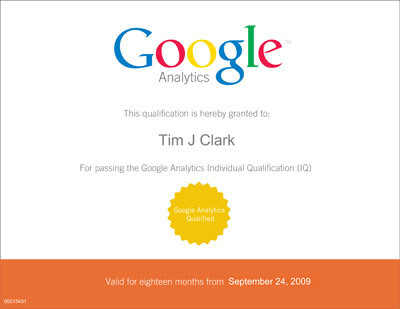 Google Analytics IQ (or Individual Qualification) is awarded in recognition of graduating from the Google Analytics course. Which is an online course in web analytics techniques and Google Analytics implementation, administration, and analysis tools. Google introduced the exams back in March of this year to help individuals and small companies prove they are qualified in Google Analytics. Today I took the test and passed with 85%! w00t! Google Analytics is a service offered by Google that generates detailed statistics about the visitors to a website. It can track visitors from all referrers, including search engines, display advertising, pay-per-click networks, email marketing and digital collateral such as links within PDF documents. Historical analysis and exportable reports make the system very useful to web marketers. When integrated with AdWords, users can review online campaigns by tracking landing page quality and conversions (goals). Goals might include sales, lead generation, viewing a specific page, or downloading a particular file. By using Google Analytics, marketers can determine which ads are performing, and which are not, providing the information to optimise or cull campaigns. If you would like to talk to us about setting up an Analytics account for your business or would like us to look at your existing account then please do not hesitate to contact us.